VOLVO MEET IN OSOYOOS, B.C. Plans for our Volvo Meet in Osoyoos are in good shape. After the fun we had at last year's West Coast National Meet we thought we should follow it up with a more informal meet this year. The meet will be held in Osoyoos BC, located at the southern end of the Okanagan Valley on the weekend of September 13 to 15, 2002. 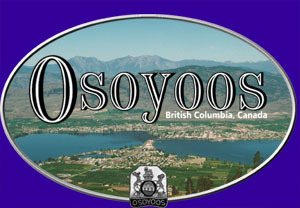 For the information of our American friends, Osoyoos is just 5 miles north of the border from Oroville, Washington. That's about 220 miles north-east of Seattle on some of the most beautiful roads in the Pacific North West. For those unfamiliar with the Okanagan Valley it is renowned for its fruit orchards, vineyards, recreational lakes and sunny weather. The Best Western Sunrise Inn in Osoyoos has been very co-operative and have given us great rates. They had 35 rooms left for that weekend and we were able to hold them all as a block. At the moment 18 of the rooms have been reserved so do not delay in making your reservation.The hotel is about a block away from the beach on Osoyoos Lake and has a pool and restaurant. - 3 honeymoon suites with one king bed and a Jacuzzi tub $89.00 +tax. These are based on double occupancy and there is a $5.00 charge for additional people. The room cancellation policy is 48 hours. The hotel phone number is 1-877-878-2200 or local number 250-495-4000,remember to mention the Volvo Club. There will be no registration fee for the meet, but we would still need you to register using the form on our website Registrations will let us know how many are coming and who will attend the winery tour, supper etc. It will also allow us to communicate with the attendees as necessary prior to the meet. This will be a relaxing, largely social event. It will provide an opportunity to get together and enjoy the company of our Volvo friends. The activities we have in mind will take advantage of the beautiful Okanagan recreational features. The lake is available for swimming or boating or just lying on the beach. There are lots of good wineries, and with the help of the hotel we will arrange a wine tasting tour by bus for Friday (48 passenger school bus) followed by an informal reception at the hotel. On Saturday we will go for a half day drive on some of the terrific local roads. Club member Bryan Coles lives in the Okanagan town of Oliver and arranges motorcycle tours of the area so he knows the kind of road we like. He will lead the way in his white 1800E. When we return from the drive we will have a car show/display at the hotel or some other interesting location. There will not be a judged concours, however we will provide peoples choice awards and raffle prizes and perhaps dash plaques. Saturday Supper will be at a local restaurant and a Sunday farewell breakfast will be at held at the hotel. Costs associated with the meet, such as food, beverages, winery tour etc. will be on a pay as you go basis. The Volvo Club of BC will provide the peoples choice awards, and solicit door prizes etc.